Why not combine the amazing history and culture of Peru with the fabulous wildlife of the Galapagos Islands on this great two-week holiday? You'll start off in Peru, with a few days in the ancient Inca capital of Cusco ahead of your trip to Machu Picchu. "Amazing! We could not fault it in any way, the guides and drivers were excellent." 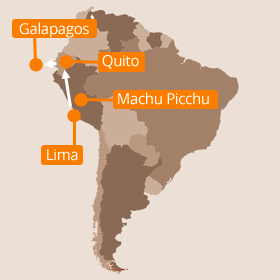 Your holiday in Peru and the Galapagos Islands will begin today with your arrival in Lima. We will meet you at the airport and drive you to your hotel in the stylish Miraflores area of the city for you to check in. Depending on your arrival time, you may just want to rest, but if you’re feeling up to it then we’d highly recommend taking a walk around the lovely Parque Kennedy and perhaps to one of our recommended restaurants to sample some of Lima’s world-famous cuisine. Our walking tour concentrates on giving you plenty of time at our favourite sites, but it does mean we don’t visit absolutely everywhere. If you’d prefer a more conventional guided tour by coach then just let us know – this means you’ll also be able to visit the famous ruins of Sacsayhuaman! If you'd like to fit in some adventure on your holiday to Machu Picchu and the Galapagos, how about spending today white-water rafting or mountain-biking? After breakfast this morning, we will drive you across to the clear waters of the Itabaca Strait. Here those who wish can have a short introduction to sea kayaking with our certified guide before taking to the waves themselves as they kayak around the coast of Santa Cruz. Those who prefer something less strenuous can stay aboard the accompanying boat as we sail around to a popular snorkelling spot, where everyone can enjoy the chance to swim and snorkel along with the local sea lions, green sea turtles and myriad schools of tropical fish. The Colca Canyon is twice as deep as the Grand Canyon and is a definite must-see while you’re in Peru. The enormous Andean Condors alone are worth a trip into the Canyon, but then when you add in the hot springs, stunning scenery, giant hummingbirds and herds of vicunas it’s hard to think of a reason you wouldn’t want to visit. You can also combine your visit with some mountain-biking through the Canyon or trekking if you’re feeling a bit more active. While the Galapagos is one of the most stunning places in the natural world, what’s the rush? Mainland Ecuador has plenty to offer, and this option has everything on the standard itinerary plus two extra nights in Quito, a tour of Quito's beautiful colonial centre, and a full day tour of the beautiful Cotopaxi National Park and its snow-capped volcanoes. You’ll see some of the absolute stand-out sights in South America, and you only need to add two more days to your holiday! Our standard price for this holiday in Peru and the Galapagos Islands is £3695 per person, which is based on two sharing a double or twin room in our standard hotels. That price includes all your accommodation, internal transport, transfers, tours, guides and all entrance fees except for the $100 Galapagos National Park fee. It also includes all meals in the Galapagos, lunch on your Sacred Valley tour, and breakfast every day.